Don S. Sturgill, former general counsel for the National Horsemen's Benevolent and Protective Association and the Kentucky Horsemen's Benevolent and Protective Association and a Lexington-based lawyer specializing in the horse industry, died on Wednesday morning at the age of 74. Considered one of the nation's foremost equine attorneys and experts on the Interstate Horse Racing Act of 1978, Sturgill was also a Thoroughbred owner and breeder. He was a partner in the Lexington law firm of Sturgill, Turner, Barker and Moloney. Sturgill began his law career in the late 1950s and was a key figure in many of the most prominent equine law cases over the last four decades, including simulcasting and syndication law. Sturgill was instrumental in the syndication on a number of high-profile stallions, including Triple Crown winners Seattle Slew and Affirmed. Horsemen everywhere in North America have reaped the benefits of Sturgill's arduous work on their behalf on issues such as simulcasting for many years. Sturgill was born May 15, 1928, in Lexington, the son of Christine Steele Sturgill and Charles H. Sturgill, who had been a Lexington car dealer. 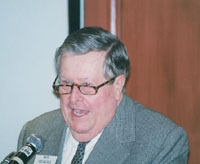 Don Sturgill graduated from Baylor School in Chattanooga, received a bachelor's degree from Harvard University in 1950, and received a law degree from the University of Kentucky College of Law in 1955. He also served in the Air Force. Sturgill served as Commissioner of the Kentucky Department of Public Safety upon graduation and was named "Kentucky Man of the Year" by the Louisville Courier-Journal for his work. In 1960, Sturgill joined the national presidential campaign staff of then-Senators John F. Kennedy and Lyndon B. Johnson in Washington, D.C., after which he returned to practice law in Lexington. In 2000, Mr. Sturgill received the prestigious Henry T. Duncan Award from the Fayette County Bar Association. He was a member of the Fayette County, Kentucky and American bar associations, Christ Church Cathedral, the Keeneland Club, Thoroughbred Club of America, Harvard Club of Lexington and Idle Hour Country Club. As a breeder and owner, Sturgill formerly operated Beaconsfield Farm with his brother Tom. He was an avid racing fan who very rarely missed a day at Keeneland during live racing. Sturgill is survived by his mother; his wife, Ann Dubuisson Sturgill; and a brother, Thomas C. Sturgill. Funeral services will be held at the Christ Church Cathedral on Market Street in Lexington on Monday, October 7, at 11:45 a.m. EDT. Visitation will be from 3 to 5 p.m. and from 7 to 9 p.m. Sunday at W.R. Milward Mortuary - Broadway.